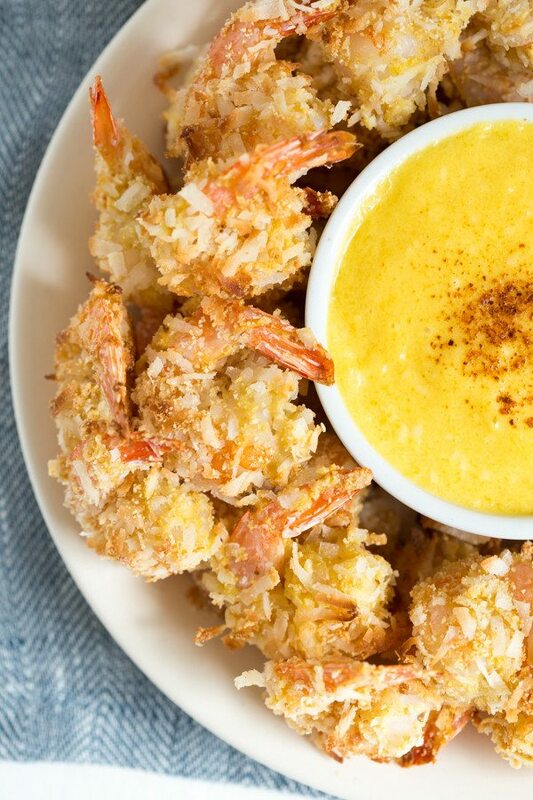 Coconut Shrimp with Mango Coconut Dipping Sauce is a fresh and flavorful appetizer or snack made with coconut flakes, fresh mango and more! Perhaps it’s the cold weather or the desire for a vacation, but lately I’ve been craving tropical flavors. 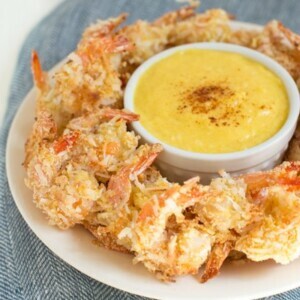 Coconut Shrimp with homemade mango coconut dipping sauce is a fun and flavorful appetizer or snack that gives you a taste of the tropics. 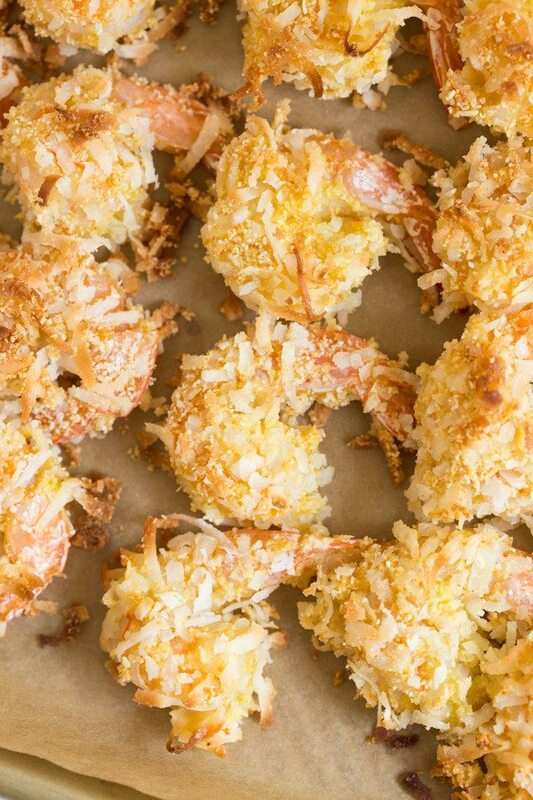 Crispy coconut layered over fresh shrimp is baked in the oven rather than fried. It is easy to make coconut shrimp at home and creates an impressive appetizer to share with friends and family. This recipe comes together relatively quickly. The shrimp is baked in the oven and comes out crispy. The mango coconut dipping sauce is made with fresh mango, shredded coconut and a few other simple ingredients. The dash of cayenne enhances the flavor and you won’t be able to resist dipping into the fresh sauce. You can even make the sauce ahead of time and store it in the fridge until you are ready to serve. 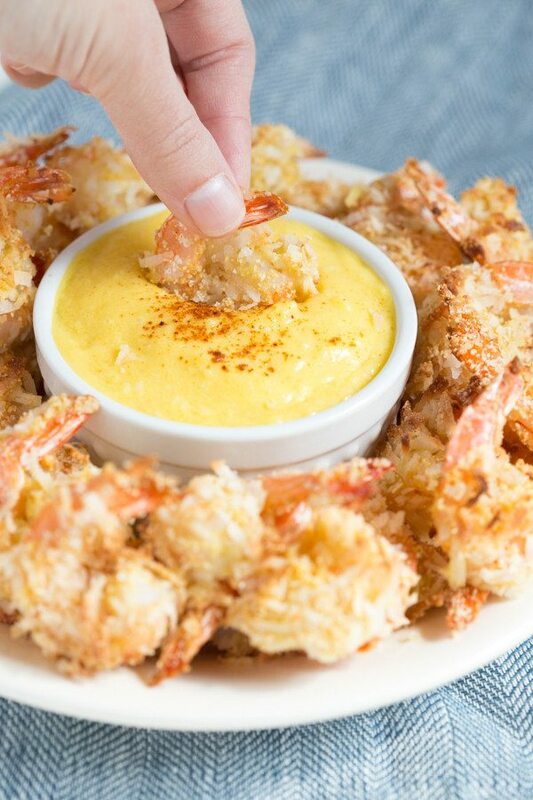 Make homemade coconut shrimp as an appetizer for a dinner party, light lunch or snack. Don’t forget the mango coconut dipping sauce! To make the mango coconut dipping sauce, combine all of the ingredients for the sauce in a food processor. Process until smooth. Chill until ready to use. In a large bowl, combine the coconut, bread crumbs and cayenne pepper. In a small bowl, whisk the eggs. In a third bowl, add the cornstarch. 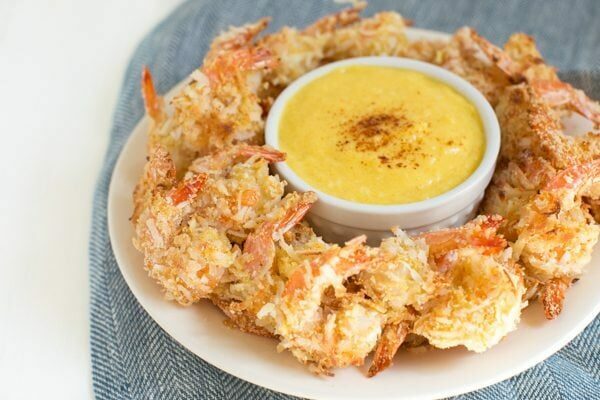 Dip the shrimp in the cornstarch until lightly coated, then dip in egg and then roll in the coconut mixture. Place the shrimp on the prepared baking sheet. Repeat with the remaining shrimp. Bake for 15 to 20 minutes or until the shrimp are cooked though and the coconut is crispy and lightly golden brown. Serve immediately with the mango coconut dipping sauce.